What trends do you think will shape the future of UK plastics? How will PlastikCity respond? For the sake of repetition, I will avoid the subject of recycling as this has been extensively covered by previous interviewees. I have to say I’m very optimistic about our future. I’ve ridden out at least two very harsh manufacturing recessions and each time our surviving suppliers and manufacturers emerged more efficient and productive. I now sincerely believe our industry is as lean and dynamic as any of our counterparts. If owners and stakeholders are prepared to commit to long term returns by continuing investment in equipment, technology and training, I can only see us continuing to prosper. Clearly, we don’t know the impact of Brexit yet but if the outcome doesn’t disadvantage our economy, then I remain confident. 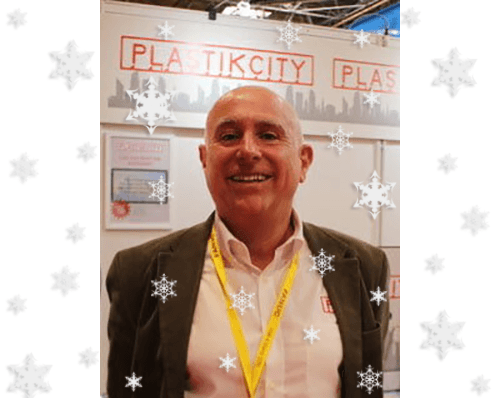 PlastikCity is a tool that helps manufacturers improve procurement efficiencies and give them easy access to the UK’s premium suppliers. So, whatever the future, companies should be using us to access these suppliers and use our platform to ensure they always get the best value for their money. How has PlastikCity developed during your tenure? I started PlastikCity six years ago from the back of my house. Many said I was crazy, but I took the decision to leave my MD role of an excellent company and start PlastikCity, a tool that had no blue print in the market. I did however believe there would be a need for a modern, digital procurement platform for our industry, but with so many ‘oldies’ like me in management roles, I didn’t know when! As it happened it wasn’t long before we took off and I had to start growing the team. Since launching PlastikCity in 2012, we started PlastikMedia in 2016. Only this year we took on the brave challenge of the North American market, so I guess we’ve developed pretty fast. The key for me has been having great role models. Starting with my father (who ran a large plastic moulding & extrusion company), followed by Peter Jackson at Sandretto and then Terry Woolley at Negri Bossi, I’ve always had someone to aspire to and learn from. My wife Sarah has always believed in my decisions (even the crazy ones) and given me unconditional support and without her I may have sometimes taken easier options. What they’ve all taught me is to be fair in all my dealings. It sounds simple but with every decision I take I ask myself if I’m being fair. If I can answer yes, then I’ll move on, but if no, I will re-evaluate my decision. I like to think I apply this principle both personally and professionally. Starting my new career at Sandretto at the tender age of 21, was one of the biggest. I’d hardly ventured out of North Wales, then suddenly I found myself moving to Yorkshire and responsible for the sales of Sandretto machines across the North of the UK. This was a scary time and I had to grow up pretty quickly. But obviously the biggest challenge has been making PlastikCity a success. Whilst you never know what’s around the corner, I’m especially delighted that this challenge has also been the most satisfying. My advice would to be to always watch and learn. You’re never too old for this. I also say to people whatever your job, always strive to be the best in that job. If you do that, you’ll always get satisfaction and without doubt your efforts will ultimately be rewarded. I can’t recall any specific advice I received, aside from my father once saying to me, that if you go out for a drink with a customer always make sure you’re one behind them! I’m told it’s cooking, but my wife says it’s very hidden if it’s true! I’m a bit of a World War Two historian and my passion is building model vehicles and planes from this period. I did play football for Chester City as a youngster, so I guess I must have been pretty talented to make this grade.